I find this article interesting because it’s rare to get insight in WOWOW’s drama rating and this piece has some information (though it focuses on the drama). 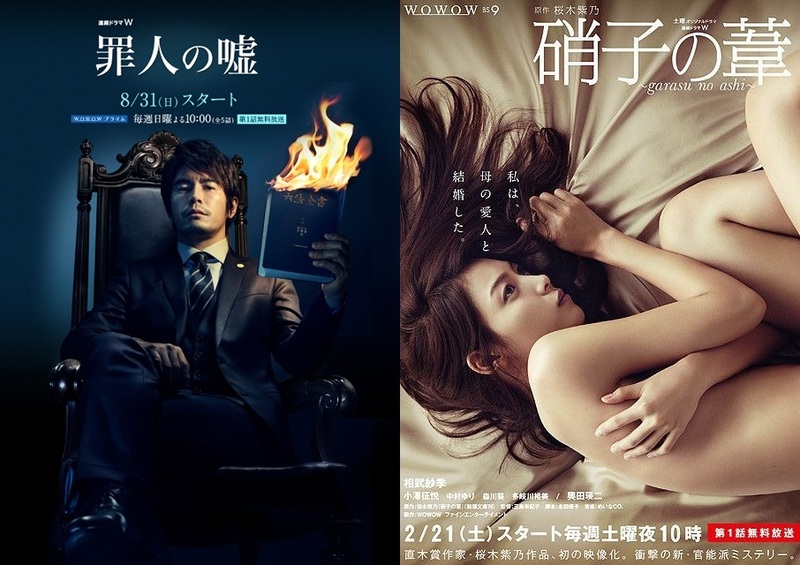 Starting from highly popular Fall series Aibou (TV Asahi), alongside Last Cop (NTV), The Sniffer (NHK), Career (Fuji TV), ‘Detective Shows’ are booming. On the other hand, it is WOWOW’s Suishou no Kodou: Murder Analysis Squad (starting 13th November, Sundays 10pm) that draws the line with terrestrial cop series. It is the sequel of Ishi no Mayu that broadcasted in August last year. Led by Kimura Fumino, it also features similar cast from previous series such as Aoki Munetaka, Watanabe Ikkei and Koyanagi Yu. I was hoping for a sequel since the author, Asami Kazushi, wrote a total of 6 books for this particular Murder Analysis Squad series. So when they announced this few months ago, I was really glad. Suishou no Kodou is actually the third book. Not sure why they skipped the second one but maybe they’re picking more interesting stories. Common question: Do you need to watch Ishi no Mayu before this? Suishou no Kodou takes place a year after the Toremi case in Ishi in Mayu. The team consists of mostly the same members, except for Kadowaki and Chief Kamiya. A new member, Ishikura has joined the team while Director Teshirogi leads the task force. Toremi from last year’s mortar serial killer case has been sentenced to death. Kisaragi Toko tries to visit him from time to time, only to be refused. At the prison, Toko receives a call from Hayase to inform them about a murder. The overall vibe of the crime scene named as Kiba case is similar to Ishi no Mayu’s first episode. Instead of mortar, this time, a man, Kiuchi Sashi, has been slashed on the neck, left to bleed, and then red paint is poured all over his head. What makes it even more bizarre is that paint is poured all over the apartment. The signs for ‘correct and wrong’ or Maru to Batsu are written on the front door. What sets WOWOW dramas apart from the rest? Just something that popped up in my mind so I thought of discussing the matter. I’m no expert about the channels in Japan so this is based on what I observed so far. They often tackle darker and grim plots. Overacting is almost non-existent. Everything is toned down when it comes to WOWOW, you won’t see characters acting out of the world, exaggerating or unrealistically (unless the character is required to but still rarely seen). The acting is often more subdued and restrained. WOWOW seems to be quite picky when it comes to their actors/actresses. People you don’t normally see in the prime time channels, you’ll most likely see them appear in WOWOW. For example those who have been playing supporting roles. You also rarely see idol-related people in them (the only exception from recent ones I’ve seen so far was Maeda Atsuko in Kageri Yuku Natsu and Nogizaka46 girls in Tenshi no Knife). Cinematography is just on a whole other level when compared to other channels. This is something I really like about WOWOW. The camera work and lighting are similar to movie style. The same goes with the quality background music. I’m not sure if they use different types of cameras or it’s really just the style of directing…I’m not an expert in movie cinematography so if anyone knows more, please share your opinions or thoughts below. The 5-episode and sometimes, 4-episode format works really brilliantly despite how short it is. Having cut the length into half of what is usually offered, it doesn’t feel draggy. Pacing is often faster and it’s convenient if you don’t have time to chase after 10-11 episodes of drama. Last but not least, it just gives a more adult ambience in my opinion. Probably due to the target audience. So if you’re into more serious and realistic stuffs, then try WOWOW dramas. For anything else, you can go for the other channels. The only downside so far is how rarely they get subbed compared to other channels’ dramas. With this, I’m referring to English subs of course. So what are the things you like or hate about WOWOW dramas? For me personally, I really liked Kageri Yuku Natsu (subbed) and though MOZU (subbed) (WOWOW x TBS) was more well known and slightly overrated (it’s getting a spin-off and movie soon), it left me very disappointed by the end of second season. Great cast wasted in a poorly written plot. I hope the movie fares better and answer more questions, for example what exactly is Dharma? For more recent offering, do try Shi no Zouki. I like the collaboration they had with Taiwan and getting to hear Mandarin is something fresh. The twist is also quite surprising and I like the whole ambiance. It can be slightly dark and heavy towards the end when they start questioning about organ trading/donation and the medical ethics. If you’re into black comedy, you have Enka: Gold Rush but beware that it might be slightly draggy. I recently just finished Tenshi no Knife. You can read my review here. As for police suspense thriller, Ishi no Mayu (subbed) has taken off really well too so watch out for that. I have yet to finish Zainin no Uso because the lawyer jargon is a bit too complicated for me to watch without proper subs. I’m a bit lazy to really rack my brain too but it’s saved up in my collection. I might give it a go in the future. I’ve watched Garasu no Ashi as well. Dark protagonist and basically quite depressing. Next on my list to watch is Yami no Bansosha.